This veggilicious chili hits the mark across the generations. Years ago, I brought it to a senior’s chili cookoff, where it got a thumbs up from my grandmother and her fellow residents. Now, my toddlers and my son gobble this up all winter long. Fear not, spice-lovers – you too can enjoy it! Simply add some extra zip before serving. 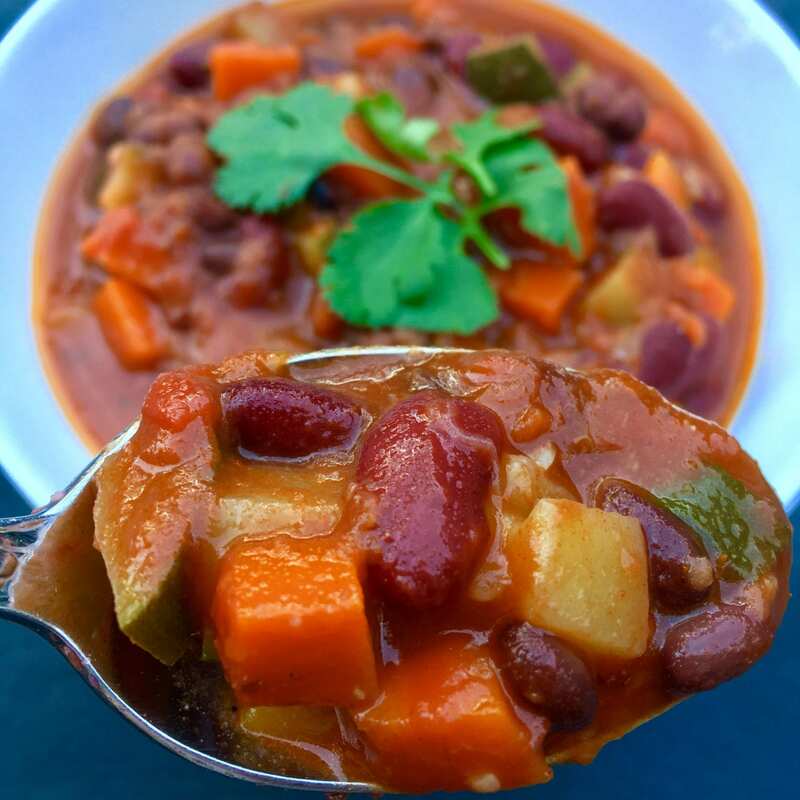 On the nutritional front, this chili rocks, especially when it comes to fiber and iron (thanks, beans). Better yet, the vitamin C in the tomatoes helps boost iron absorption. For those that want an even heartier dish, add crumbled tofu or ‘veggie beef crumbles’. Note: Go easy on this dish if your gut isn’t used to large doses of fiber. The jingle is true… Beans, beans, the magical fruit, the more you eat the more you toot! Chop veggies into bite-size chunks (carrots, bell pepper, zucchini). Chop onion more finely. Mince garlic (or use pre-minced). If using tofu, rinse, pat dry with paper towel. Heat oil over medium heat in a large pot. Cook onions first for 5~10 minutes on low. Add garlic first, then carrots, bell pepper, chili powder and cumin. Cook, stirring frequently for another 5-10 min, until all are tender. If using tofu, crumble with your hands as you add into pot. Stir in zucchini, pasta sauce, tomatoes, and beans. Add enough water to just cover everything. Increase heat to high and bring to a boil. Reduce heat to low; cover and simmer 15-20 minutes. Longer is better but not needed for the basic kid-friendly version. Serve as-is for the kids with a side of bread – multigrain or cornbread as a treat. Amp up the spices for the adults – sprinkle with chili flakes and/or or Tabasco. A little cilantro adds a nice kick. Dairy-lovers may want to add sour cream or cheddar cheese but my kids and I are happy without.